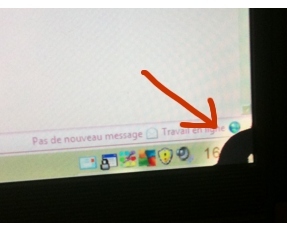 Yesterday I discovered a tiny black spot in the lesser right corner of my computer monitor; Today, this black spot has grown and almost entirely covers the clock on the toolbar. There's also a sort of yellow glow surrounding the black hole; Any clue what that is? Antimatter? A black hole? Looks like my monitor has cancer or something. I hate the thought of being forced to buy a new monitor, if that thing grows bigger.